The Lord of the Rings is one of the great works of fantasy literature, which in turn spawned one of the great works of modern cinema. However, while the books got three separate films, and then each an extended edition, the man who created Middle-earth is finally getting one of his own. 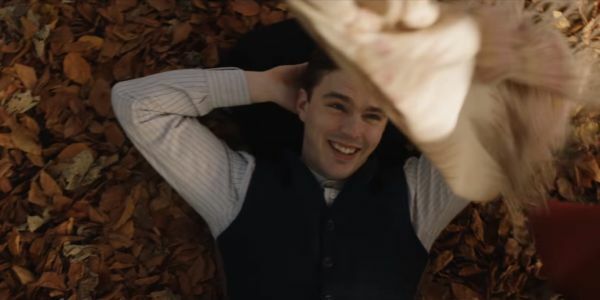 Nicholas Hoult will play the title role in Tolkien and we now have our first look at the upcoming feature. Check it out. At under a minute, this first trailer is barely more than a tease of what Tolkien has to offer, but it packs quite a bit into its 55 seconds of run time. The voice over promises us a story about journeys taken to prove ourselves, adventure, magic and fellowship. It sounds a lot like the Lord of the Rings, of course, as it seems that Tolkien will follow the early life of the author and focus on the way his own life influenced the work of epic fantasy he would create. Based on the plot synopsis, the story will follow the orphaned author as he goes off to school and finds friendship and love, before those friends then go off to World War I, potentially tearing their “fellowship” apart. We do get a combination of real world performance and an artistic element that looks more like The Lord of the Rings itself, seeming to indicate that the the film won’t simply imply the connection between the man and the work but actually show how the two relate in some way. After Tolkien’s work has given us so much, it’s nice to see a movie being made about the actual person who created The Hobbit and The Lord of the Rings. Most people probably don’t know all that much about him. Giving him one movie when his work has received six seems only fair. Of course, this movie doesn’t appear to be a complete biopic, instead focusing on only a small part of the life of John Ronald Reuel Tolkien. While this would mean a lot of his story may be left out, it also means that some real time can be given to this part of the author’s life and the characters in it. One of the unfortunate problems with biopics is that they end up giving only a surface level look at the subject’s life because there ends up being so much time and information to cover. Instead Tolkien is set to make a deeper dive into a shorter period of time. Who knows, maybe J.R.R. Tolkien will get the Lord of the Rings treatment and get three movies to tell his complete story. It’s unlikely, but a nice thought. Tolkien will be in theater May 10.